Connections and communications with a couple of canine compatriots gave us an interesting beginning to the Northwoods adventure. Our home-base hostel-cabin was full last weekend so we were trying to decide what to do when a friend invited us to go with them to the Audubon Environmental Learning Center in northern Minnesota—it was a primitive cabin but we were geared for that. 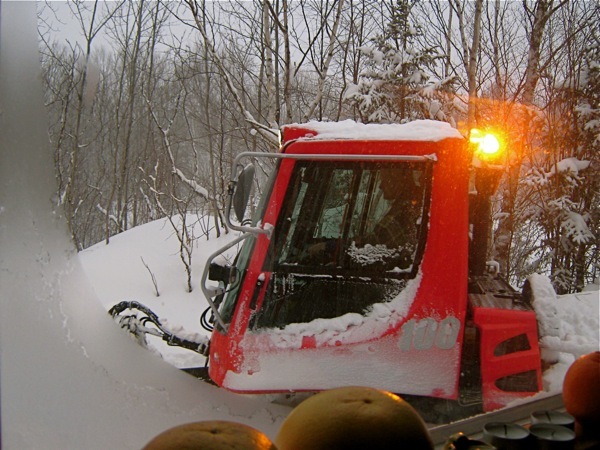 We couldn’t ski very much because of lack of snow, but we could at least leave town on the day we had hoped. The arctic blast then swooped down into the Upper Midwest and our friends’ ice climbing class was cancelled, so it was just Scott and I arriving to a cold cabin in the -20 air with 45 mph wind! We stuffed the breezy holes with hats, paper towels and anything we could find, and after 12 hours the cabin was finally warm and cozy. Then things began to get interesting. Over the next few days of our stay we had many encounters with two aggressive German shepherds. At first we thought they were neglected neighbor dogs but soon deduced they were living in a bird blind in the nearby wetland area. They had collars but no tags and were likely either abandoned or separated from someone visiting and had been living out there for a few months, and a few months is long enough to experience the trauma of losing family and pack and to become extremely defensive and fearful. Their fangs were bared and the barking was ferocious, but the tails between the legs gave away that they were terrified and probably would not attack. So Scott went to work on them. He has an incredible gift with dogs, understanding their language on a deep level and knowing how to let them be dogs….many of the problems that arise with dogs is that we humans don’t understand dog-talk and dog culture which leads to much confusion and neurosis. He spent the next few days with them (even though the high temp in the day was -4) trying to play and feeding them treats, helping them forget that they were scared and aggressive…even if it was for a few moments. Meanwhile in the cozy cabin I had begun reading “The Elephant Whisperer” (I had given the book to Scott as a gift but I really wanted to read it!). It’s about Stephen Anthony and his work to save a herd of aggressive wild elephants that were going to be shot, he was able to communicate with them and through recognition and respect he pleaded with them to stay in his South African reserve because if they escaped they would be killed by the authorities. And right there outside the cabin door was the exact same scenario—we found out that these dogs would likely be shot this week. They had been aggressive towards other people (had even trapped an intern in a tree) so the call to the DNR was inevitable….we knew that with aggressive dogs there is not much time for patience and in the country a shotgun is generally the solution. The last night of our stay (unbeknownst to me) Scott was freaking out. He had made connections with these two female shepherds and even came close to coaxing them into the cabin. He lay in bed silently asking them to calm down for they would face certain death that week. The next morning he laid out the options to me…either we could stay longer and he would work with them, or we ask the Audubon Center to find someone to work with them and he could be in phone contact every day for consultations about dog behavior. “Okaayyy….” I said skeptically. If these dogs had been abused I wasn’t sure if there was hope. But I trusted Scott. 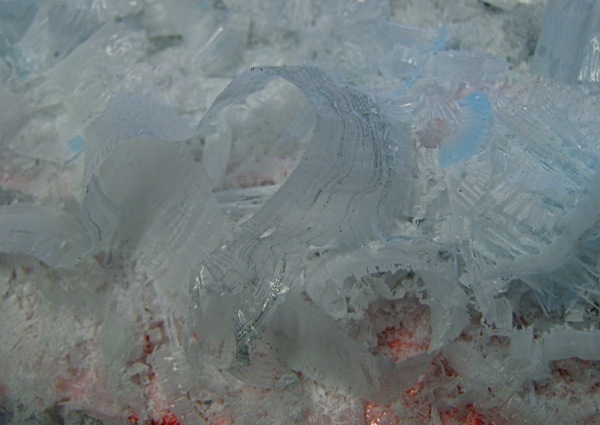 This is wax scraped off the skis, curled and frost-like. 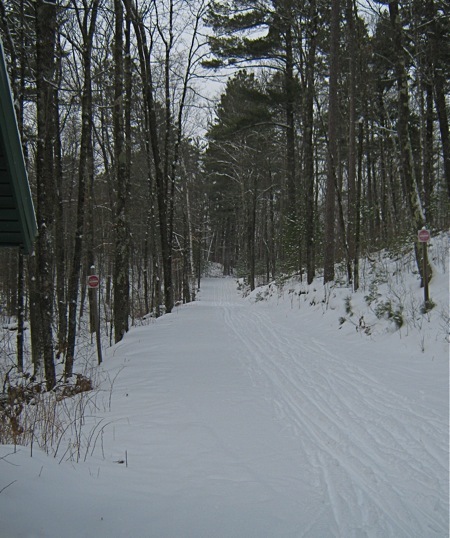 We eventually arrived at our home-base hostel-like cabin in northern Wisconsin and prepped for our trek to the ski-in Cabin at ABR in the Upper Peninsula of Michigan. Cooking, waxing, freezing, packing…it’s a bit complicated to plan for a week so I’m grateful I save my packing lists from other years! Then came the day to pack it in. Using backpacks and a pull-behind sled called a ‘pulk’ we slogged our supplies through the deep falling snow out to the soon-to-be cozy cabin and immediately started the fire. Life would now become much simpler…eating, skiing, eating, trotting to the outhouse, sleeping, and taking saunas. 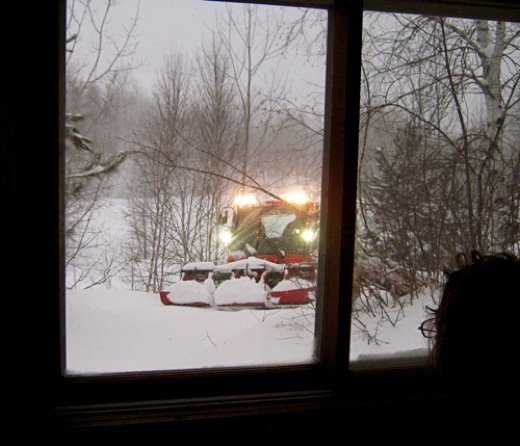 While out grooming the trails Eric gave a rare surprise morning visit to our cabin with the Pisten Bully. 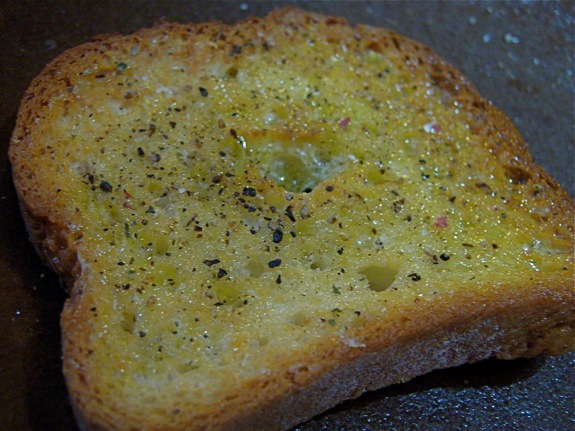 A favorite snack anytime is a simple garlic bruschetta but in the cabin it is especially fun. Bruschetta is a term that is used loosely—toasted bread with various toppings like cured meats, tomatoes and basil, cheese, beans, and peppers. A warm open-faced pile of Yum. Just as focaccia is the root of all pizzas, a simple garlic bruschetta is the base of all other scrumptious toppings. It can be eaten with soup or dinner, and the raw garlic packs a wallop to any invading cold that may be lurking and waiting to strike. Garlic bruschetta is my cure for the common cold. 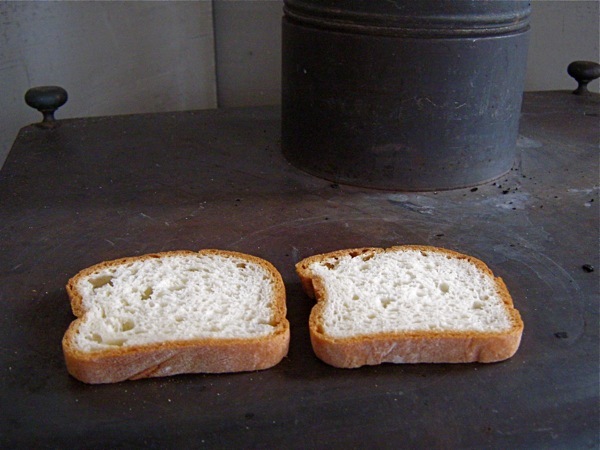 The idea is to make the bread as crispy as possible so it creates an abrasive surface on which the garlic will be rubbed. The roughness will scrape the garlic clove away like a candle on coarse sandpaper. My friends who spend time visiting in Italy tell stories of coming home from the bar hungry for a snack. They would set pieces of old bread onto embers in the fireplace and then search for the red wine. When toasted (the bread, that is) they would finish the job with the garlic and the fresh local olive oil, then eat their late-night snack with a final glass of red wine. Then off to bed in the fire-warmed cottage. That’s the romantic little tale they would tell and I fantasize about it every time I eat this treat…and now I have cabin memories to add to the mix! 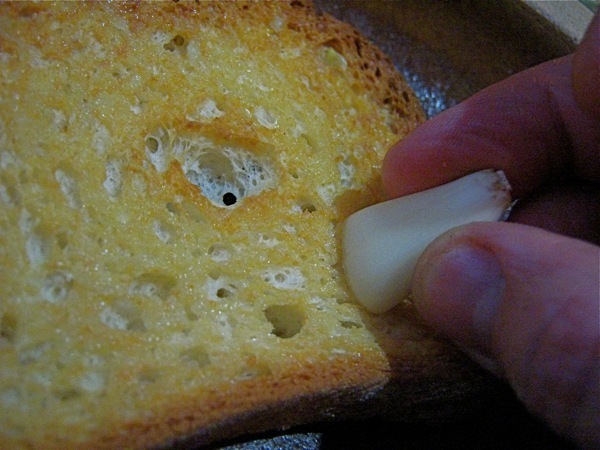 Scrape the garlic onto the crispy bread, as much as the bread will take. Close your eyes and crunch. 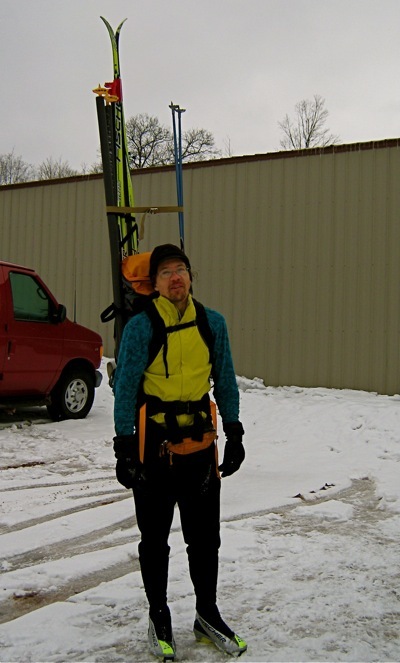 Scott bringing the rest of the skis out to the cabin. What, you are going to make me wait a week???? I need to know. Sounds like you are having adventures as is usual. Please update us!! What a cliff hanger!!! What happened to the dogs?? Hope you continue to have a good trip. P.S. When some people go on vacation, they do other kinds of “waxing.” Ha, ha. 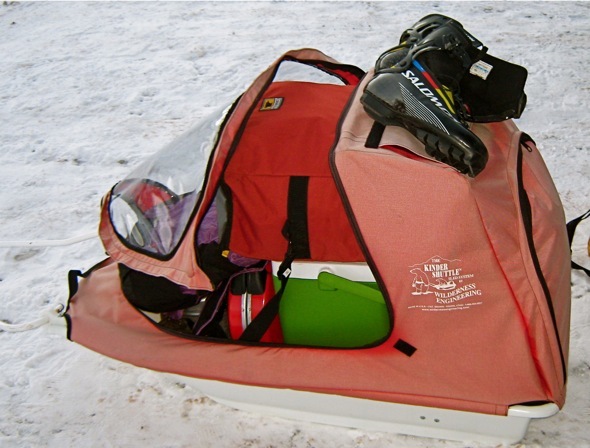 It was a spa for the skis!